Helping with a Down Payment: Gift or Loan? In 2012, 14 percent of all home buyers and 24 percent of first-time buyers got a little help from their friends and relatives in the form of gifts to help them with their down payment. Gifts were second only to savings as a source of cash meet today’s stiff down payment requirements, which average between 7 and 8 percent of the mortgage and even higher for non-FHA loans. Lenders review gifts carefully to make sure they’re not loans in disguise, something that would increase your overall debt levels. Your lender will require you to document the gift in a letter that states the relationship between the parties, the address of the purchased property, the amount of the gift, and sometimes the source of the funds used to make the gift. The letter should also clearly state that the funds are a gift and not required to be repaid, and be signed by you and the person providing the gift. Generally, lenders prefer that a down payment gift come from a close relative, rather than a friend or second cousin. The donor should also provide proof of their ability to give the gift—for instance, evidence of a stock sale, or a statement showing the withdrawal. Once the money is in the borrower’s account, the lender may want to see proof of a deposit in the exact amount stated in the gift letter. Keep in mind that there’s a ceiling on the size of the gift lenders will allow. With a conventional loan, most require that borrowers pay at least 5 percent of the loan amount with their own money. But this minimum does not apply if the borrower is getting a gift that amounts to 20 percent or more of the home purchase price. 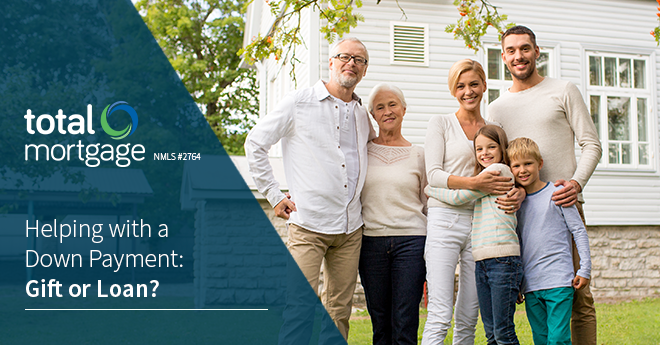 Borrowers applying for an FHA loan may use gifts to cover their entire down payment. Gifts that exceed $14,000 a year from an individual or $28,000 from a couple are subject to federal gift and estate taxes. Creative parents who plan ahead can give $28,000 to a married child and another $28,000 to his or her spouse in December, and do so again in January for a total tax-free gift of $112,000. However, if a donor’s largesse exceeds the exclusion, he or she must pay a gift tax. Rather than being paid now, the tax can be applied against the unified gift and tax credit, which is $2,081,800 for 2014 and a total of $5,340,000 of gifts during a person’s lifetime. If the gift exceeds the exclusion, the person giving the gift would have to file a gift tax return on IRS Form 709. If the gift tax is a problem, another option is a loan from a family member or close friend. A loan can help you dodge the gift tax, though it may raise issues with your lender’s underwriting standards. To comply with IRS regulations, you will need to document the loan and add payment terms and collateral, if any. If you don’t, the person giving you the loan may find himself paying income taxes on interest he never received and gift taxes on money he never gave away. In order to clarify that the loan is not a gift, he should write a memo establishing that you, the borrower, were solvent at the time of the loan. This proves the individual granting the loan has a reasonable expectation of repayment and is not actually making a gift. If you’re borrowing this money to buy a home, you should also take the extra step of legally securing the note with your residence, which requires a lawyer. That way, your interest payments on the down payment loans can be added to interest on your mortgage, increasing your interest deduction. If your loan exceeds $10,000 and you don’t set an interest rate on your down payment loan, the IRS will do it for you. If it is really a loan, the IRS maintains, interest must be paid, and if interest is being paid, someone is making taxable income. They will set an interest rate and tax the interest you pay to your lender. It’s a better idea to set a modest interest rate yourself. One last tip? Whether you’re receiving a gift or loan, it’s smart to raise the down payment money and deposit it in your account several months before you apply for a mortgage. All data from National Association of Realtors’ 2012 Home Buyer and Seller Profile. Hi , I receive $13,000 every year from my Mother as a gift. Can the be counted as income when refinancing a home? Mr. Cook- We want to help our married daughter with a $100,000 down payment, secured by a 2nd mtge on her new home to be repaid by a future inheritance (no interest).Our conundrum is if a “gift” we are defrauding the Lender. If a “loan” we are defrauding the IRS (imputed interest) What approach would you suggest? I have the same question as Mr. Marc. Could you please answer? Thanks!